1. Is it safe to leave a dog with a muzzle on for a long time? It is not recommended to leave your doggy without control while muzzled. Try to keep your dog within your eyesight when he wears a muzzle because he can get hurt. If a muzzle is made of metal, a dog can hurt himself trying to pull it off. If he wears a loop-like leather muzzle, watch over him as he can’t drink or eat without your help. One of the most popular dog muzzles in our store is this Easy to Use Multifunctional Wire Cage Muzzle for safe walking and training. 2. Which muzzle is better? A leather or a wire cage? A wire dog muzzle provides your pet with better airflow. It allows him to drink water and pant while being muzzled. On the other hand, a leather muzzle is a better solution for winter and cold weather, it does not reflect sunlight and usually more lightweight in comparison with wire cage muzzles. Both kinds of muzzles are easily adjustable. We offer different sizes for almost any medium or large dog breed. 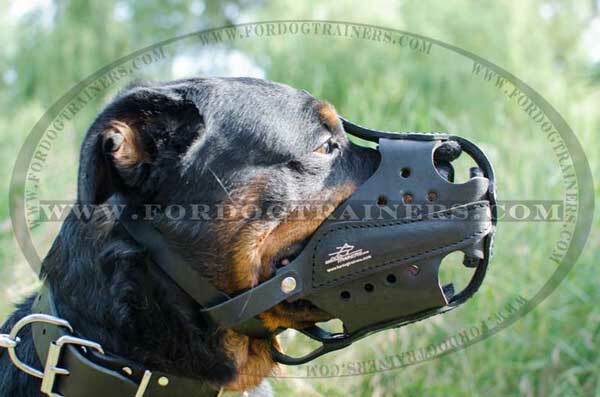 Check a wide variety of Walking and Training Leather Dog Muzzles and Durable Wire Cage Muzzles for Daily Use. 3. What kind of muzzle is the best for taking a dog to a vet? The majority of dog owners use muzzles only for this purpose. 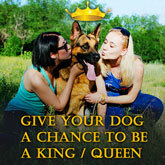 You should get a muzzle which will be comfortable for your dog and which allows free panting and breathing. We recommend this Lightweight Wire Cage Dog Muzzle for visiting a vet. If you already have a similar model, but it doesn't meet your needs, please feel free to contact us and we will suggest you something well fit and comfortable. You can check a brilliant offer - purchase Basket Wire Cage Dog Muzzle for different kinds of activities. 4. What is the best muzzle for dog transportation and traveling? We recommend to use the same dog muzzle models for dog transportation as for the vet visit. Such a muzzle should have enough free space for your dog to pant and breathe. Good air circulation is also extremely important for this purpose. Be aware that you must keep your dog always muzzled during transportation procedure. A dog may be stressed in such situations and his behavior can become unpredictable. So the muzzle is a must-have attribute. But please first make sure that your pet got used to wear a muzzle in order not to feel discomfort during transportation. For some dogs even the fact of transportation cause enough stress. For this purpose you can choose this Durable Leather Dog Muzzle for Dog Transportation and Comfortable Leather Dog Muzzle for Traveling. 5. How to size a dog properly to choose the best fit muzzle? While it might look as a complicated task, be patient and spend few minutes to size your dog properly and as precisely as possible. We’ve prepared for you an easy diagram and special instructions to help you to measure your canine for a proper dog muzzle. You may need a helper to do it. In 99% of cases when a dog is measured properly, you will get the best fit muzzle model. We do have a Fair Flexible Exchange Policy, but it would be better to avoid this hassle and get a good fit dog muzzle after the first try. Follow this link to read tips - How to Measure Your Dog for a Muzzle or you can watch our Video Tutorial. 6. Are there adjustable dog muzzles that fit puppies? It will be great if you manage to get a supply which can be adjusted as long as your canine grows. This option depends on the design of the muzzle. 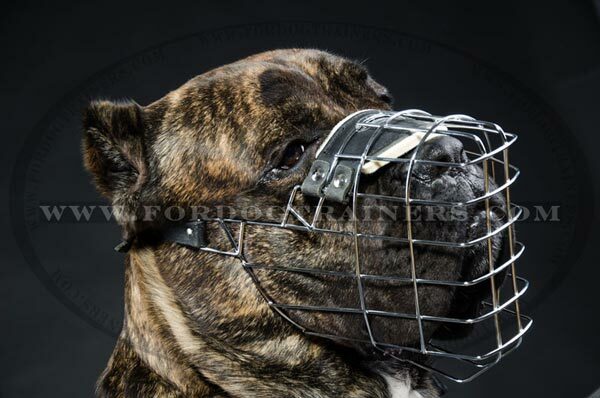 Usually, metal muzzles are with fixed shape wire cage and adjustable straps as well as some leather ones. Also, there are leather muzzles that allow to adjust part which covers your dog’s snout. But if you want to provide your dog with maximum level of comfort or if you need to buy a muzzle for a certain purpose, you will probably have to purchase several muzzles until your puppy becomes a fully grown dog. It means big expenses, but it will be better than saving money on your dog’s well-being. Also, remember that it is not recommended to buy muzzles for small puppies. 7. Will a dog be able to drink and eat with a muzzle on? Most of the wire basket muzzles allow your dog to drink. All you have to do is to use a deep bowl. Your canine can just dip the cage into the dish and enjoy fresh water. Wire muzzles also allow you to give small treats, moreover, it is one of the ways to teach your pet to wear a muzzle. Some of the leather dog muzzles which have open nose design, like this Royal Nappa Adjustable Dog Muzzle also allow to drink water. But it will be impossible if your doggy wears a leather basket muzzle. Besides, under the influence of water the leather may get wet and dry again and again, so it can crack and result in a bad odor. For example, you can consider to buy this Reliable Metal Dog Muzzle that allows your pet to drink and eat small treats. 8. Do I need to purchase a leather dog muzzle with agitation steel bar? If you want to involve your dog into professional agitation training, you should get a stronger muzzle with special leather covered steel bar. It helps to maintain the shape of the muzzle and protect your dog from possible traumas. 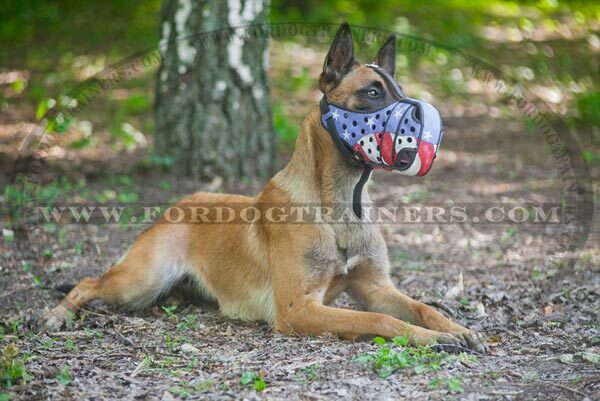 Such kinds of muzzles are popular among dog trainers of police and military canines, so there is no need to purchase a muzzle with agitation bar for daily usage. Attack Training Dog Muzzle Made of Genuine Leather. 9. Do I need to buy a dog muzzle with a soft thick felt padding inside? All of our muzzles are padded with soft material in the nose area. It can be made of felt thick or Nappa leather. It is a special kind of full grain genuine leather made of lamb skin. It is very soft, beautiful and pleasant to touch. Both paddings protect your dog from skin rubbing or irritation. You are welcome to check this Nappa Padded Training and Walking Dog Muzzle and Leather Dog Muzzle with Felt Thick Padding. There is a wide variety of Soft Thick Felt Padded Leather Dog Muzzles and Wire Cage Dog Muzzles with Soft Padding. 10. Can a dog swim with a muzzle on? Swimming demands complete perfect air flow. A muzzle should be water resistant to stand corrosion after water contact. You can choose for water activities wire cage muzzles because they correspond to these needs. Just don’t leave your dog alone while swimming. Remember you are responsible for your canine’s comfort, health and life. 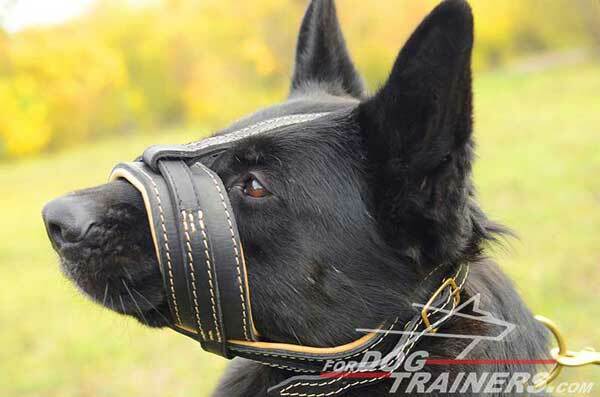 Click here to choose among a wide range of Training and Walking Dog Muzzles Collection.